Google has just released their new version of Google chrome – Chrome 10 beta. 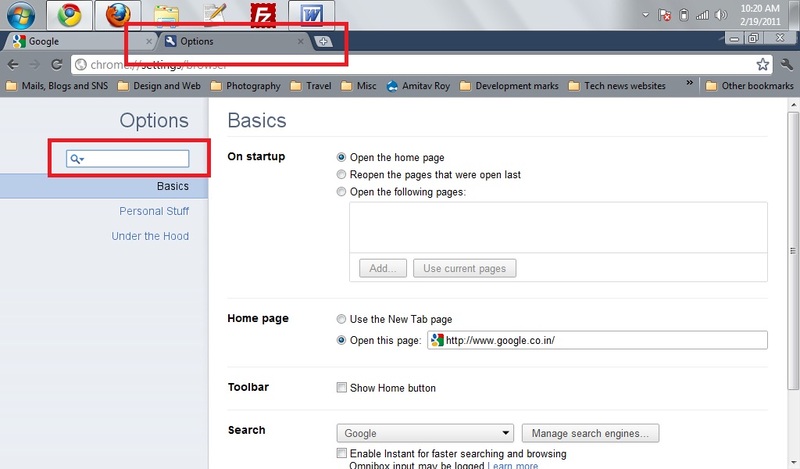 So, let’s check out what are the new features or advancements to the new very popular browser. It now has an interesting new options tab. Yes, the good old options popup will now open up in a tab as shown below. There is a very handy search box which is very intuitive. If you are not able to find the correct place for one setting, this is the solution you need. I am sure other browsers will look into this. I would like to see Firefox coming up with such a feature, it has so many tweaking options and one can sometimes really get lost. One more advancement is the GPU acceleration for videos. This is very handy when you are watching videos on full screen. They claim a significant drop in CPU usage with this new feature. So what are you waiting for? Go grab the new version of their website.